We had my daughters 10th Birthday party yesterday. She has officially grown out of the character themed party decorations she loved in the past (YES!). This year we classed things up a bit and chose a black, white and red palette. 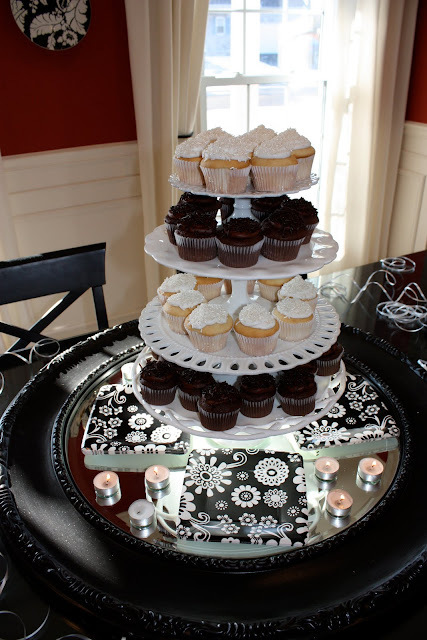 For the table scape, I used a round black mirror for the base of the cupcake tower. Then, I stacked up my white cake plates and loaded it with custard filled cupcakes. I love the pearlized sprinkles I found at Hobby Lobby. Party bags stuck here and there, curly ribbon tossed around and a few balloons completed our decorations. Very simple and low cost.